Prices for more than 2000 €. University or Conservatory students and professionals who have reached the maximum age of 35 by the start of the competition, may take part. Finale : 29.03.2019 - 15.30 - 18.30. Only amateurs between 13 and 17 years of age may take part. Regulations and Prizes for the 2. Aalborg International Guitar Competition for classical solo guitar. Many thanks to our sponsors for making this competition possible. 1. Maximal playing time, 12 minutes. 2. Playing time starts as soon as the participant has taken his or her seat. 4. The repertoire being performed must include at least two historical periods. 5. All compositions must be performed from memory. Depending on the number competitors, the competition organizers reserve the right to put up an extra day within a weeks notice. 1. No less than 20 minutes and no more than 25 minutes of playing time is allowed. 2. The playing time starts as soon as the participant has taken his or her seat. 4. Compositions performed in Round One may not be repeated in round Two. 6. All compositions must be performed from memory. One Round Only: Date: 29.03.2019. 1. Maximal playing time, 8 minutes. In Cash € 500,- and 3 concerts in 2020. Ignatius Gall Foundation, Holland (Fee 250€). We work for more concerts. Diploma and some guitar accessories. Free participation at the 2020 edition of the masterclasses at the Aalborg International Guitarfestival or free participation in the 2020 Aalborg International Competition. A Diploma and some guitar accessories. 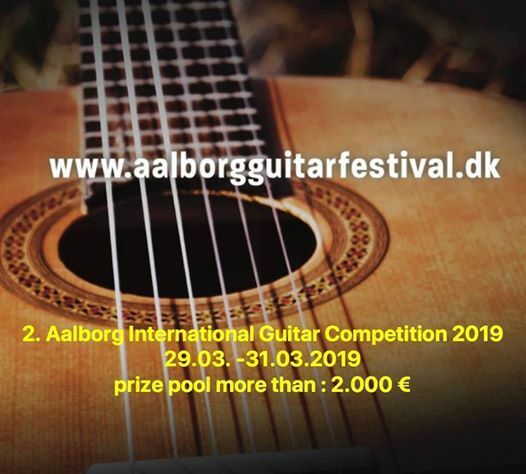 € 100,- in cash and free participation in the 2020 edition of the masterclass held at Aalborg International Guitarfestival or free participation in the 2020 Aalborg International Guitarfestival Competition. Diploma and some guitar accessories. Refund of participation fee and a diploma. Category 2: All participators will receive a diploma, if they take part in the talent seminar or the masterclass and are present at the Participators concert on the 18th of march 2018. Prof. Bernard Hebb. Will be announced. Frederik Munk Larsen, Søren Bødker Madsen and Mikkel Lynggaard. a. The regulations of this competition. b. The decision(s) of the jury. c. The general rules of the competition. 1. 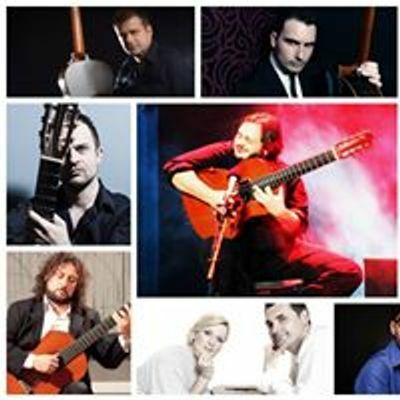 The competition is organized by the ”Aalborg International Guitar Festival & Competition” and is open to classical guitarists of all countries. 2. The decision(s) of the jury is final. The system of judging is an internal system and is not open to public discussion. 3. The deadline for all applications is March 15th, 2019. 4. Applications will not be accepted until the registration fee has been received. 5. Only 50% of the registration fee will be refunded if a participant decides to cancel his or her active part in the competition. The cancelation deadline is March 1th, 2019. 6. If a participant cancels his or her participation in the competition after the 1th of March 2019, no registration fee will be refunded. 7. The organizers of the competition have the prerogative to refuse an application. 8. Each competitor is obliged to announce the compositions he or she will be performing. 9. 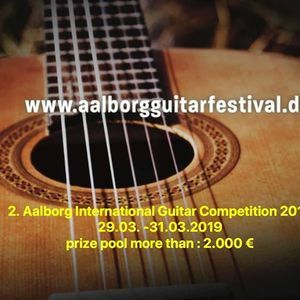 First prize winners at the Aalborg International Guitarfestival & Competition in Categories One or Two, may not sign up again for the same category at the next competition. 10. The organizers of the competition have the right to regulate the number of participating guitarists in each category. 11. The competition is open to the public. 12. If a participant is not present in due time, he or she will be excluded from further participation in the competition without remittance of the entrance fee. 13. The jury has the prerogative to interrupt any player that exceeds the time limit specified in Categories One and Two. - Four participants in Round One will be selected by the jury to take part in the final round. - The sequence of performance will be selected the evening before Round One commences by drawing lots. At the conclusion of Round One, lots will again be drawn for Round Two. - For the audience prize in Category One, each attending member of the audience, who is present at the final round, is allowed only one vote. - Participants must bring 2 copies of the pieces they will perform in both rounds. The compositions a participant wants to perform must be put in a sealed envelope with the participants name on it. The order of the pieces that are to be played must also be written on the envelope. This envelope must be handed over to the organizers of the competition between 18.00 and 19.00 o’clock on the 28.03.2019 or between 9.00 and 10.00 o’clock on the 29.03.2019. The address will be announced as soon a possible. Please note: Scanned documents by e-mail will NOT be accepted. There is only one round. The sequence of performance will be selected by drawing lots the evening before the competition commences – and sent by email or sms to the participater. The Aalborg International Guitarfestival & Competition is entitled to make audio and visual recordings of the competition and arrange broadcasts and distribute these recordings without any remuneration to the performers concerned. All problems and/or situations not covered by the above regulations, will be decided by the organizers of the competition.